In Hindu Mythology, Samundra Manthan is one of the best known episode.When Durvasa Muni offered a special godly garland to Indra,he rejected it and put it on Airawat,his elephant,which crushed it.Due to the disregard,sage got antagonized and cursed Indra and other gods by saying they would lose their powers.It made Indra frightened as god started to lose every war against Demons.He went to Vishnu for help and Vishnu came with a plan of Samundra Manthan where gods have to churn the oceans to get Amrita(Magical Nector).To complete this task they got help from deamons as gods were not capable to do it alone.They started to churn it using Mount Mandara as churning rod and the king of serpent,Vasuki,as churning rope.Different things started to pop out,both positive and negetive. 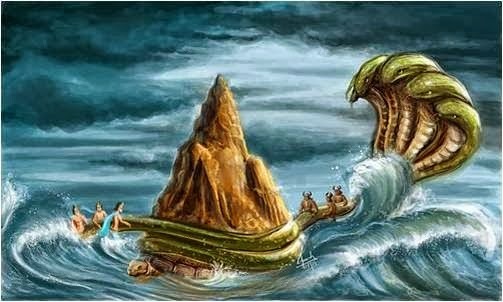 Shiva consumed Hulhala(extremely poisonous drink) as it could destroy creations.Finally they were successful to harvest Amrita and Gods tricked Demons and got it for themselves. Its a inner conscience of Homo sapiens which teaches the plight to get balanced between good and evil.Everything is balanced.We have Gods on one side while demons on the other side.Both trying to achieve existence.This friction have produces things like Hulhala(Sufferings,Pain,Anger,Greed) and Amrita(Love,Care,kindmess,trust,respect).Likewise everything is balanced.Too much love will destruct you and too much pain will kill you.Everything needs to be balanced,that's the law.One can't exist without other.We are bounded by the natural law to act like what we are now.The sufferings you get from your life is a part of you.But it will not continue forever as your superego will fight,your gods will fight and may someday you will experience bliss. Today in this Information world,people are busy in their daily chorus to improve their life .They "want" complete euphoria. "WANT"-Yeah!we want it!We are demanding it as in its ours to take.But have you ever asked yourselves that why we do not crave pain and sufferings.Gods achieved the Amrita while giving Demons nothing.Its in our nature to look for enchanted situations.The jubilation clouds have blocked our view from the beauty of negativeness.The melancholy form is beautiful same as euphoric form but we need to realize it before its too late. Neutral stance is the best option to attain felicity.Each suffering should be started in celebration. Then you change the quality of suffering itself. Each suffering should be welcomed through celebration; then the suffering is no more suffering. Osho says,Remember, if you have not known sadness together with happiness you have not known anything yet. Then your happiness is superficial; your sadness is also superficial. Then you have been living on the surface; then you have known only the waves; you have not known the depth of the ocean that you are. Learn to accept,learn to secure,learn to suffer.learn to love and may be,may be someday we will understand whats life all about.